USA Rice Vice President of Government Affairs Ben Mosely spent last week here as part of a delegation of members from the U.S. Agriculture Coalition for Cuba (USACC). 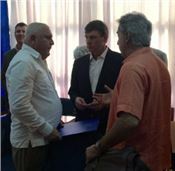 Rice was by far the most popular topic of discussion during the many meetings held with various departments of Cuban government, farmer cooperatives, importing agencies, and the ports system. The group of more than 30 U.S. agriculture representatives on the trip met with the Cuban Ministry of Foreign Trade and Investment (MINCEX) to kick off their arrival to the island. This introductory and welcoming meeting covered a broad discussion on the current laws and regulations restricting free trade between the two countries as well as the commitment on both sides to continue efforts to achieve normalized relations and bilateral trade. On Tuesday, the group traveled to the Port of Mariel with officials from the Special Economic Zone to learn about the rapidly developing port and the incentives being offered to foreign investors to operate in the “free trading zone.” Later that day the delegation visited with officials from the U.S. Embassy where Mosely provided an update on USA Rice’s efforts to persuade Congress to remove financing and commercial barriers and the trading restrictions that will allow U.S. grown rice to competitively serve the Cuban market.